Heavy-Duty Industrial stairways and landings provide durable, reliable access to mezzanines, platforms and entryway to upper offices and floors. 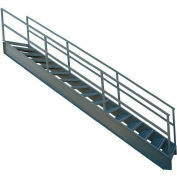 Rugged 10" c-channel construction provides rigid support. 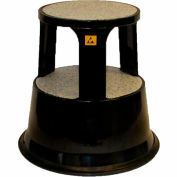 Serrated treads for maximum slip resistant footing, 36 degree climbing angle with 36" wide X 9-1/2" deep steps. 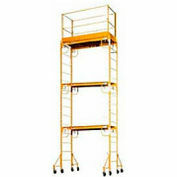 1-1/2" sq. 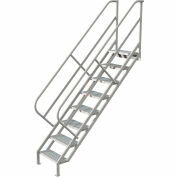 tubing handrails that rise 32" above stairs with mid rail. 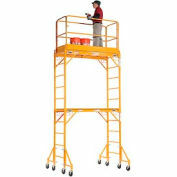 1000 lb. 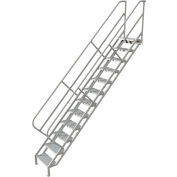 capacity and all welded design offer strong design with easy installation. 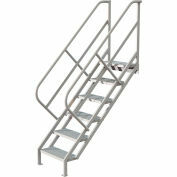 Custom stairways and landings available upon request.